The 700+ hedge funds and money managers tracked by Insider Monkey have already compiled and submitted their 13F filings for the second quarter, which unveil their equity positions as of September 30. We went through these filings, fixed typos and other more significant errors and identified the changes in hedge fund positions. Our extensive review of these public filings is finally over, so this article is set to reveal the smart money sentiment towards Entercom Communications Corp. (NYSE:ETM). While there was a slight increase in hedge fund ownership of Entercom Communications Corp. (NYSE:ETM) during Q3, the number of shareholders is still just half of what it was three quarters ago, as just 14 hedge funds tracked by Insider Monkey were long the stock on September 30. One of them was Amit Nitin Doshi‘s Harbor Spring Capital, which talked about ETM in its second-quarter investor letter, saying that the death of radio has been overstated and that Entercom’s effective leradership and narrow focus on radio should help it improve the financials and operations at the heavily mismanaged CBS Radio, which Entercom acquired last Q4. 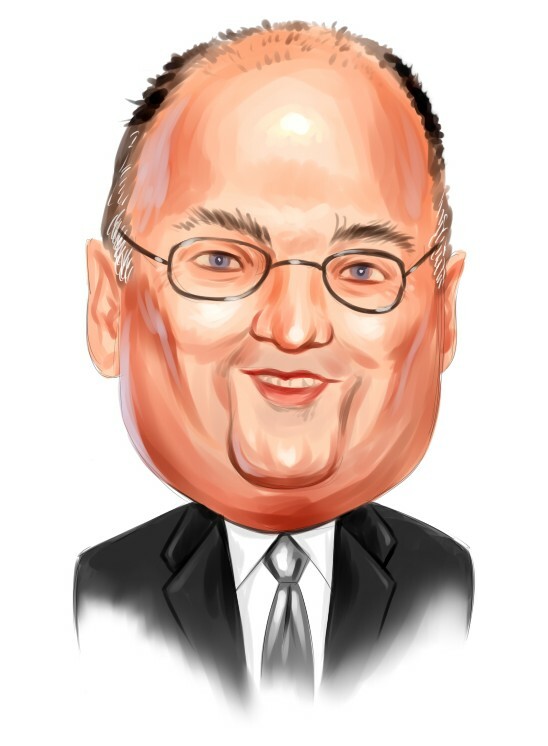 What have hedge funds been doing with Entercom Communications Corp. (NYSE:ETM)? Heading into the fourth quarter of 2018, a total of 14 of the hedge funds tracked by Insider Monkey were bullish on this stock, a 17% increase from one quarter earlier. 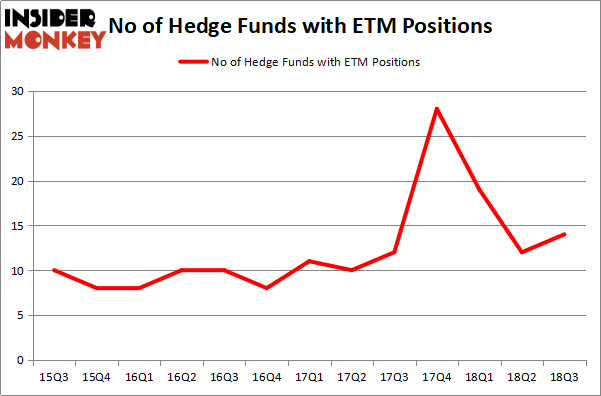 The graph below displays the number of hedge funds with bullish position in ETM over the last 13 quarters. With the smart money’s capital changing hands, there exists a few key hedge fund managers who were boosting their holdings considerably (or already accumulated large positions). Among these funds, Scopia Capital held the most valuable stake in Entercom Communications Corp. (NYSE:ETM), which was worth $62.8 million at the end of the third quarter. On the second spot was Sessa Capital which amassed $41.1 million worth of shares. Moreover, Harbor Spring Capital, Point72 Asset Management, and Tensile Capital were also bullish on Entercom Communications Corp. (NYSE:ETM), allocating a large percentage of their portfolios to this stock. Consequently, key money managers have jumped into Entercom Communications Corp. (NYSE:ETM) headfirst. Millennium Management, managed by Israel Englander, created the most outsized position in Entercom Communications Corp. (NYSE:ETM). Millennium Management had $1 million invested in the company at the end of the quarter. Joel Greenblatt’s Gotham Asset Management also made a $0.7 million investment in the stock during the quarter. The following funds were also among the new ETM investors: Dmitry Balyasny’s Balyasny Asset Management and Michael Platt and William Reeves’ BlueCrest Capital Mgmt..
Let’s go over hedge fund activity in other stocks – not necessarily in the same industry as Entercom Communications Corp. (NYSE:ETM) but similarly valued. These stocks are Forum Energy Technologies Inc (NYSE:FET), Golub Capital BDC Inc (NASDAQ:GBDC), Lexicon Pharmaceuticals, Inc. (NASDAQ:LXRX), and Malibu Boats Inc (NASDAQ:MBUU). This group of stocks’ market caps are similar to ETM’s market cap. As you can see these stocks had an average of 12 hedge funds with bullish positions and the average amount invested in these stocks was $54 million. That figure was $193 million in ETM’s case. Malibu Boats Inc (NASDAQ:MBUU) is the most popular stock in this table. On the other hand Forum Energy Technologies Inc (NYSE:FET) is the least popular one with only 9 bullish hedge fund positions. Entercom Communications Corp. (NYSE:ETM) is not the most popular stock in this group but hedge fund interest is still above average. This is a slightly positive signal but we’d rather spend our time researching stocks that hedge funds are piling on.